AP Model School Registration Certificate 2019 for inclusion in the 6th class was approved by School Education Commissioner, order to be admitted to the AP Model Schools, participants must take the entrance test on 2019 (Sunday). The test will be conducted in all Andhra Pradesh school buildings from 9 AM to 11 AM. 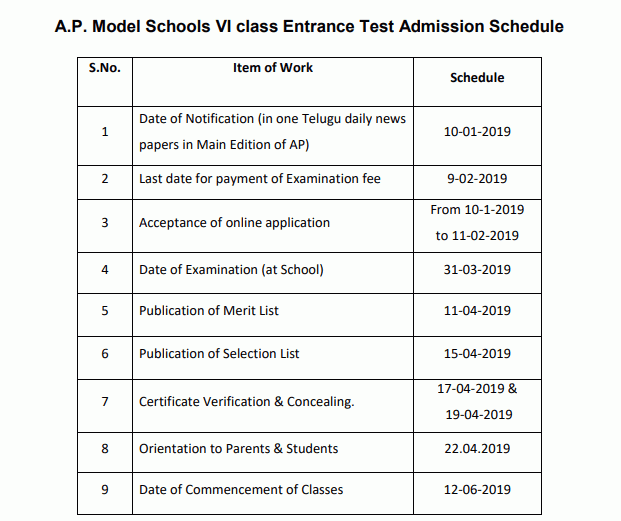 For the appearance of the AP Model School Entrance Test 2019, students should only apply online mode. The model school entrance test will be carried out in Telugu / English medium from the 5th class Syllabus. No fees for admission to the model school to pay. For OC, BC students should be born between 01-09-2007 and 31-08-2009. For SC, ST categories should be born between 01/09/2005 and 31/08/2009. Student should study in the government school or government school continuously and should study in school during the academic year 2019 in the 5th class. Further information can be found in the information sheet at www.cse.ap.gov.in. After completing the required qualifications as above for admission to the 6th class, go to the nearest AP Online / Mee Seva online centers between apply online. The examination fee for OC and BC is Rs 100 / -. For SC and ST students, the examination fee is only Rs 50 / -. Required qualification marks in the test for OC and BC at least 50 marks. For SC and ST students at least 35 marks. The admission is based on the performance in the entrance test and the rules of the reservation. The initial test will be objective type and multiple choice questions from grade 5 and the question paper will have four parts for 100 marks.